These beautiful PERLAVITA beads are made in the bollicino technique our "Tiny Bubbles" line. Each bead has randomly placed bubbles inside, best seen by looking from the side. It is a technique we use in vases and our drawer pulls but a first for us with our beads. 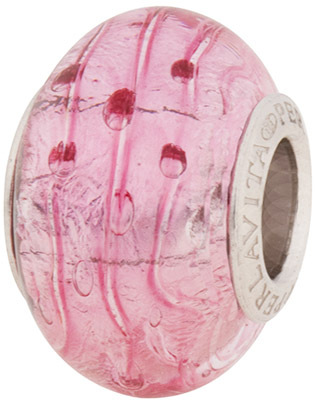 The bead is Rubino (hot pink) Murano glass over .925 sterling silver and the insert is rhodium plated sterling silver. The size of the hole is about 4mm and the bead is about 13-14mm in diameter. This will fit most popular bracelet systems.